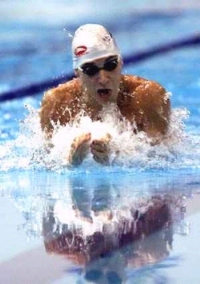 Darren Mew was always a promising junior, with three successive 100m breastroke final appearances in the European Junior Championships culminating in a 1997 bronze medal, but he has also made the often perilous leap into senior competition with relative ease. Coming off the back of the that junior medal, he won bronze in the 100m breastroke at the last Commonwealth Games in Kuala Lumpur and has his eyes set on going two better this summer, whilst also aiming to get the British record back from his teammate and rival James Gibson. At the Commonwealth Trials you broke the British Record for the 100m. Were you expecting to do that? Not in the semis as I was holding back a bit, so I was a bit surprised at the finish to see that I’d actually got it. I’ve been after Nick [Gillingham]’s record for quite a long time so to actually get it was pretty good. James Gibson broke it again just 24 hours later, has that spurred you on to get it back? Following that disappointment was it good to get your own back in the 50? It was – the same happened at Christmas at the European Short Course, he stepped up and beat me on the 100 and I came back and beat him on the 50. Which do you think is your better event? I still class the 100 as my main event, the 50 is just a bonus, so hopefully in the summer I can get my number one position back. You used to swim on the Isle of Wight, but moved to Bath recently was that a big change? Do you get on with your coach? I’ve got a great coach in David Lyles and we’re really in tune with each other. We’re good friends as well, so I think we have the perfect relationship to get the best out of my swimming. I’ve stayed with the student squad so I can continue to work with him, which has been really good so far. What’s your worst training set? I do a lot of sculling with a half pull at the front end of the stroke with my legs dragging, to work on feel of the water. Finally, what would be your top tip for the up and coming breastroker? Technique. When I was younger I had a lot of speed, and I used to over rate my stroke a lot. Since moving to Bath I’ve worked on my technique I’ve been able to build strength on my technique so I’m only getting stronger and getting more out of my stroke.